Growing a Bird of Paradise in a container is really easy to do. This beautiful tropical pant displayed in a container looks marvelous. 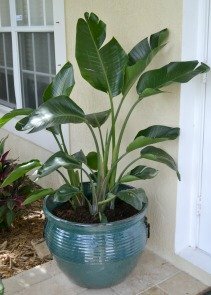 If you are looking for that tropical look in and around your home this might be the perfect plant for you. It can easily be displayed alone in a corner or next to a couch. The enormous draping leaves will give you that appearance of paradise. Looking to add color to your patio? The Orange Bird is a perfect selection for you. The beautiful flowers will add a hint of color to your existing palette. However, if you have an open space and need something to fill the area, the White Bird is best for you. This tropical beauty has large extending branches and the perfect height. 1) Find a location in your home or outside your home that receives at least 6 hours of bright light. * During the winter and fall months you want to make sure to move your pot so that the Bird of Paradise receives direct light for about 6 hours. *If you live in an area that is extremely hot during the summer months your tropical plant may not need as much direct light. Watch the foliage to make sure it’s not getting burned. If you see this occurring, move the plant to another location were the light is not as intense. 2) Indoor potted plants: Check the soil twice a week to see if the top inch layer is dry. If so add water to the Bird of Paradise. When adding water, make sure you add until you see the water coming out of the holes in the bottom of the pot. If the pot contains a drip tray make sure to empty the tray. Make sure that any pot or container you use will allow the water to move freely. Outside potted plants: Check the soil daily, especially during the hotter months. Follow the same procedure as an inside plant with the watering technique. Allow the top 2 inches of soil to dry out before the next watering session. 3) Birds of Paradise that are located indoors should be fertilized biweekly in the spring and weekly in the summer. Your tropical plant will respond to the fertilizer during their active months of growth. Using an all-purpose fertilizer will work just fine. During the fall and winter do not fertilize. The bird will begin a rest period where it will not grow. When we keep tropical plants indoors they are not getting the same nutrients as the tropical plants outside. This is why you should fertilize them to help them receive all the proper nutrients. Plants that do not receive enough nutrients will display week stems, slow growth, dwindle in flowering and pale leaves. 4) Misting the foliage will help during dry weather.